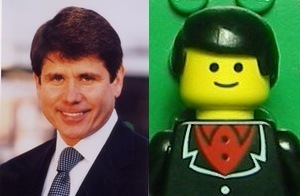 Of course Stephen Colbert was right when referred to Rod Blagojevich as a “Lego Man” on tonight’s Colbert Report. The photographic proof is right there – hell, even the side parting is the same! I’m just embarrassed that it took me this long to notice it. Oh, no – I still look the same. It’s the site. With the new year comes the first WP template I’ve found for this site that I really, genuinely like (as opposed to just ‘tolerate’). All normal features have been restored, save for the Dopplr badge (it doesn’t seem to want to play well with the stylesheet). The next task is to add… um… what’s that thing, that people consume online… OH! New content! I need to get around to adding new content. Soon, I promise. Make your voice heard – VOTE. As citizens, we’re not asked to do much. We pay taxes – we may not like it, but that’s how the government pays the bills. From time to time, we serve on juries, so that the justice system can work the way it was intended. And at least once a year, we vote – for school budgets, for local government, for Senators, and for Congressmen. But every four years, on the first Tuesday after the first Sunday in November, we are given the right – nay, the privilege – of making our voices heard and casting a ballot for the person who will guide the ship of state and serve as America’s representative on the global stage. Four years ago in this space, I suggested that voters reject the two major party candidates in favor of an animated character…and prior to that, I had suggested voting for ‘none of the above’. I’ve never believed that voting was unimportant, but the last general election felt flawed in every possible way, and honestly, I had reached a point where I wanted nothing to do with the process. Fast forward four years – we’ve been through a 20-month ‘election’ cycle and endless primaries. But despite all that, this year is different. This year’s general election is about more than just a choice between ‘Republican’ and ‘Democrat’. It’s about more than a referendum on the last 8 years of government. And believe it or not, it’s about more than history (although, yes, the nation will either elect the first African-American President or the first female Vice President). This election is about the future. More specifically, how we as a population want to be represented in a global community; how we want to be governed; about the legacy we leave behind, and the trail we blaze. Whatever you think of the major party candidates, there’s no denying that this election is about more than which man gets to keep the big chair in the Oval Office warm. The old saying goes “I don’t know much about art, but I know what I like.” Well, I don’t know much about politics, but I know what kind of policies I want to support, and I know what type of person I’d want as my leader. And so, in part because I knew well in advance that I’d be traveling on Election Day, and in part because I wanted to remove any excuse for not casting a vote, I applied for, completed, and submitted my absentee ballot. That’s one vote down, several hundred million to go. I’m not going to say ‘it doesn’t matter who you vote for’, because that’s patently untrue – perhaps this year moreso than in years past. But whichever candidate you support, whatever your party affiliation, whatever your beliefs about our government may be, the most important thing you can do all day on November 4, 2008, is go to your local polling place and make your voice heard. I’m M-D November, and I approve this message. Need more proof? Take a look at today’s PVP. I don't want to go on the cart! I feel happy! I feel happy! What I’m getting at, I’m suppose, is that I’m not quite dead. I’ve just been…well, busy is something of an understatement. I know, I know – I use that excuse a lot, and it starts to lose all meaning after a while, but ‘struth. I should explain. I’ve been working an average of 9.5 hours a day lately. And when I say ‘lately’, I mean for the last couple of months, until this weekend. This weekend, I’ve been working an average of 15 hours a day. It’s not that I don’t have anything to say – quite the contrary, in fact – it’s just that by the time I get the opportunity to write, all I really want to do is turn my brain off. I also have a number of half-started projects to finish, not least of which is the editing and posting of the balance of my SXSW photos. (No, I’m not kidding.) But all in due time. Is there a designation worse than EPIC FAIL? This post serves multiple purposes. First and foremost, I want to let everyone who actually still reads this that I’m alive and well, and while work has kept me busy, I haven’t been mauled by a bear, eaten by lions, or struck by lightning. Reason the second is to test the WordPress app for iPhone. More about the iPhone adventure later. But I really think that it’s great that I can sit here in a movie theater and do something productive with my time instead of watching the annoying preshow. Trailers are starting… More later. No commentary from me necessary here – I’ll let Keith do the talking. When you’re done being outraged, go check out the Countdown website. This is what happens when I let my mind wander. Is Jellystone Park starting some kind of happenin’ ‘late-afternoon’ picnicking trend? Is Jellystone Park frequented by environmental activists, insistent on ignoring Ranger Smith and feeding the animals anyway (intentionally allowing Yogi to steal their baskets)? Is there some strange time/space phenomenon at the entrance to Yogi’s cave, causing it to be noon inside and dawn outside? Yogi Bear is a ninja. Think about it. He’d have to be really fast to get all of those baskets. He’s constantly giving Ranger Smith the slip. He speaks in riddles. And bears are the #1 threat to America. It all adds up. You think about it. Think. About. It. Previously in this space, I’ve touted the electability of ‘none of the above’, stumped for our Digital Ruler, and purported that one of the candidates for NJ Governor might eat babies. So that gives you a pretty good idea about my feelings toward the political system thus far in the ‘Oughts’. Now that the primary races are nearly done (we hope, anyway – that’s fuel for at least three or four more posts), it’s going to be nearly impossible to avoid talking about politics. I promise to try and keep things as light as possible, but given the huge ramifications of this year’s election, it won’t always be possible. Like now, for instance. Robert Reich, former Secretary of Labor under President Clinton and current lecturer at UC Berkeley, provided an interesting perspective on the true cost of the Iraq war and why the ‘100 year’ policy of soon-to-be Republican nominee John McCain could end up costing us dearly in the long run. It’s well worth the read and/or listen.